Aristokraft Cabinetry has the style, selection and value you need to bring your vision to life. With more than sixty years of craftsmanship, dedication, thoughtful design, and reliability behind them, we know how to keep your project on time and make planning your dream home simple and enjoyable. Whether you’re updating an existing room or creating a brand new space, we’ll deliver and install quality, affordable kitchen and bathroom cabinets that will stand the test of time. It’s a time to renew and refresh. And so Aristokraft has. Neutrals and transitional styles continue to be the go-to direction for kitchens and baths. Clever choices for anyone who wants to stay on trend, yet have a versatile palette to showcase their own personal taste. With Aristokraft’s latest additions, Sierra Remodeling lets you stay focused on making smart decisions, without compromising your vision. Their most recent introductions to the line are captured here. Introducing PureStyle, a cabinetry solution combining the durability of laminate and the beauty of paint. Environmentally friendly and stunningly stable, each component of the 5-piece construction is continuously wrapped to achieve a flawless appearance. The end result of Sierra Remodeling installing PureStyle laminate cabinets is a crisp look with clean details and a quality finish that is both on-trend and in demand. Never underestimate the ability of small finishing touches to add just the right amount of character to your space. 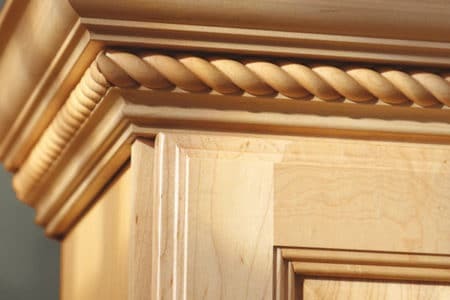 The Aristokraft range of cabinet embellishment styles is sure to please even the most discriminating eye, offering corbels, legs, feet and more to uniquely transform your space. Even the simplest of designs can be elevated by just the right touch. Aristokraft’s updated legs, feet, and corbels help finesse trending looks with their classic, clean lines. New additions include the Bar Bracket Corbel, Craftsman Bun Foot, Bun Lille Foot, Cove Shaker Corbel, Straight Bar Leg, Straight Island Leg, Square Foot, and Shaker Corbel. 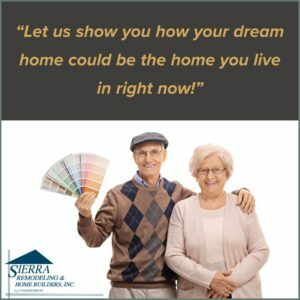 Sierra Remodeling will assist you in reaching your vision by adding just the right touches to your new cabinetry. An organized space is a happy space, we can all agree. Clear clutter and let the beauty shine while your new space functions as efficiently as possible with exciting new cabinet organization options from Aristokraft and added by Sierra Remodeling. Design by displaying with Aristokraft floating shelves. Slim and sleek, floating shelves are a hot commodity in ever-popular transitional design styles. 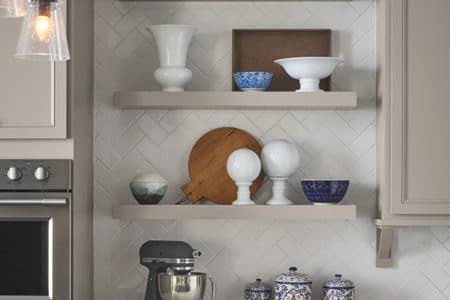 Clean and casual, Floating Shelves are right in line with today’s trend of open design, and they have many versatile uses for displaying your most treasured pieces. Artistically designed and aesthetically pleasing, Wine Storage Cabinets are a simple solve for more than just wine. Multiple sizes let you get creative with all kinds of applications. And they complement all of the transitional door styles that are oh so popular today. 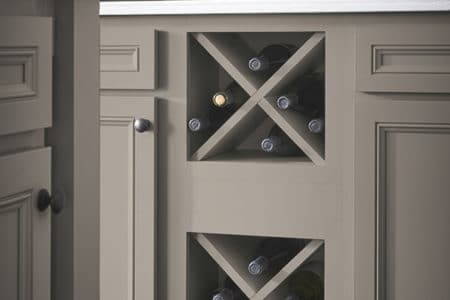 Not just for wine, these Wine Storage Cabinets take on transitional style and store just about anything you need to tuck away in your new Sierra Remodeling custom kitchen. How about a little added storage space in the bathroom? Aristokraft’s new 21″ wide linen closet is just what you need to achieve more storage and organization possibilities in a smaller space. 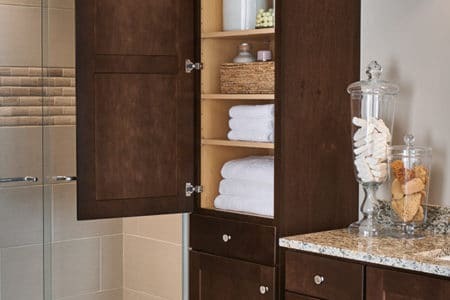 Complete with shelving and a drawer, the linen closet is ready to accommodate a variety of your bath storage needs. Achieve added storage height in a multitude of spaces with a Linen Closet cabinet, available in several widths. Plus, a drawer to keep smaller items neat and out of sight will let you enjoy even more organization possibilities.